The above image of the Hon. 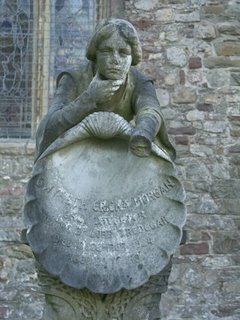 Gwyneth Morgan peering over her memorial stone at St Basil's Church in Bassaleg was sent to me by Monty Dart (photo taken by Tom Dart). Gwyneth's sad fate will be featured on the BBC 2 Wales TV Programme 'Look Up Your Genes' to be aired on November 8th. It should be an interesting programme. It was the first time I have ever really been interviewed in a lot of depth about Evan and Gwyneth. It was only in the middle of rattling on that I realised just how MUCH material we have on this era at Tredegar House. I am sure most of it will end up on the cutting room floor, so to speak, but the finished programme should give people a fascinating glimpse into two of Tredegar's most colourful, and perhaps misunderstood, characters. Goff Morgan will also be on the programme discussing Aleister Crowley's relationship with Evan. Goff delves into the darker side of things while I, being far more innocent, attempt to maintain the moral high ground! Gwyneth's memorial DOES look a little sorry for itself at the moment. Happily, this should be rectified soon. 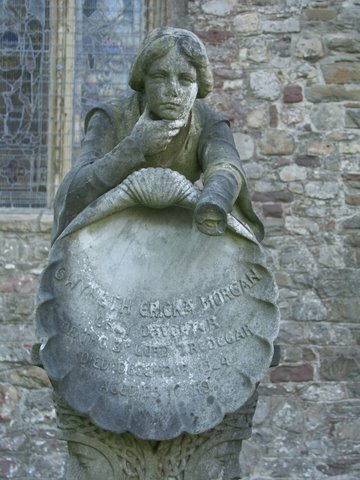 Restoration of the Morgan graves is on the agenda and we should see work progressing before March 2007. Just been to the third Halloween at Tredegar House, the first one was brilliant, last year not so good and this year, well, we were in there all of half an hour I think! What all the blood and operations and mad people are to do with Halloween I don't know, it should be about witches and black cats and things, I must say a lot of people were very disappointed. The staff were excellent though, they really worked hard, as usual. I have just joined the Friends of Tredegar House, there is something about the house that pulls me to it all the time. We normally stay at the caravan site, and usually go on a tour every time! Maybe I lived there in a different life, but I was probably only the scullery maid!! Well, first of all, Lynnette, thanks for the post, and for attending THREE Halloweens at Tredegar House. You'll be catching me up soon! I know what you mean about the 'pull' that the House has. It is a very special place with an atmosphere really quite uniqiue. I unashamedly love the place. I agree with what you say about the absence of the traditional Halloween trappings being replaced with 'horror'. I think, though, that this is something that has happened generally with Halloween in this country. Horror films have far more influence on costumes now (think of the ubiquitous 'Scream' mask, the hockey mask from 'Friday the 13th' etc.) than Pumpkins, witches and the like. As the country goes, so goes Tredegar perhaps? I even think that younger visitors are expecting the horror angle. I'm not saying this is right (I happen to agree with you). It just seems to be how it is. I am more concerned with the disappointment expressed by visitors. I am not involved with the organisation of the event, but I can certainly pass on your comments. I am sure they will be taken into account when next year's event is being discussed. Half an hour DOES seem a very short time to be in the House.